What Do Florida’s School Grades REALLY tell you? Take a moment and think about the best moments your children have had at their public school… you know, those times where they came home so excited, talking a mile a minute, about what they have seen and learned. For my daughter, this might have been when the whole third grade spent the day celebrating “Early Man,” with art, music and skits, all dressed in fake fur, dirt smeared on their faces, hair all teased up into “Early Man Style,” culminated with a “eat with your hands” feast (Thank you, Mrs. Carter). For my son, it is probably a tie between “getting to do science experiments ALL DAY” and having a Beatnik Poetry Slam that was “Oh too cool” (Thank you Ms. Osborne). I remember similar moments from my childhood and they still make me smile. These are the moments that will make or break your child’s education experience. These are when the real learning, the kind that inspires, really happens. To everyone who has provided these moments for my children, I thank you. Here’s a News Flash: Florida’s A-F School Grading System has NEVER been sufficient, it has ALWAYS provided an inaccurate picture of what is occurring is schools. Why? Because it focuses almost entirely on standardized test scores and they are a poor reflection of real learning. We hope Superintendent Jenkins understands that even with the addition of measured “learning gains” calculated from this year’s FSA scores, the A-F grading system will still be completely flawed. According to the 2015 PDK/Gallup Poll, these are the factors most important to parents when choosing a school. The primary factors being quality of teaching staff, curriculum, student discipline, class size, variety of extra-curricular activities and reputation of school. Only 15% of those surveyed felt “student achievement on standardized tests” was “very important” when choosing a local public school. Florida School Grades do not reflect what parents deem important when choosing schools but, rather focus almost entirely on standardized test scores. 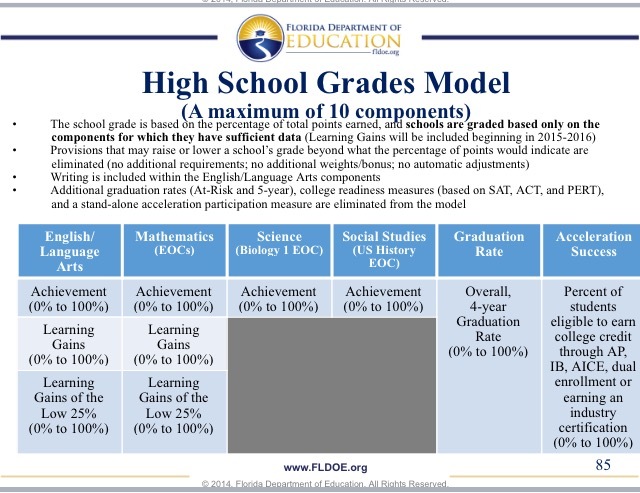 Here is the Elementary School Grades Model. Elementary schools are graded based on how well their students, in 3rd grade and up, perform on the grade level, standardized Math and English Language Arts (ELA) FSA and on the 5th grade Science FCAT. By testing students on a grade level assessment, they are looking for how many student are performing at or above average (because that is what “grade level” represents, the average performance of a child in that grade). Learning gains are calculated for all students and the learning gains of the lowest quartile of students count twice in the calculation. This year, in all grade levels, English Language Learners will be required to sit for hours of FSA testing, even if they arrived in the country yesterday and do not speak a word of english. Why? To provide a baseline for a learning gains calculation when they are again asked to take the assessment next year. After two years, English Language Learners’ scores will be counted in with the rest of the student body. Also, it is the focus on preparation for the third grade math and ELA FSA (third graders must pass the reading/ELA portion for promotion to 4th grade) that drives much of the progress monitoring and test preparation in the younger grades. Children as young as kindergarten are required to have 90 minutes of uninterrupted reading instruction, leaving little time for creative endeavors, art, music and, in some schools, even recess. (Read here to learn about the Florida moms fighting to restore recess in our public schools, after being told there wasn’t time for daily recess “given the growing demands on schools to raise test scores”). 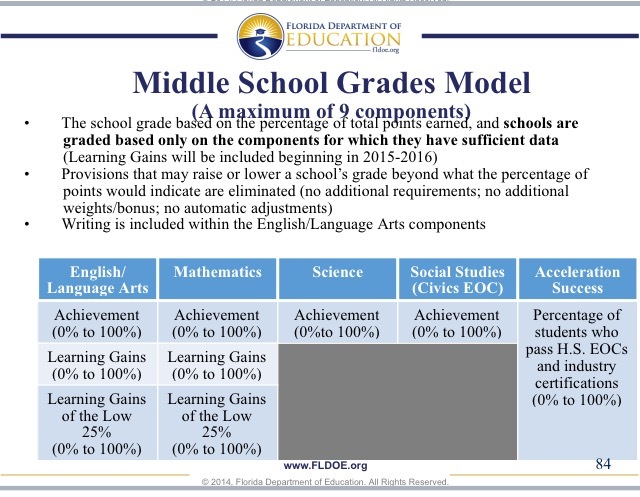 Middle schools, in addition to grade level performance and calculated learning gains on the Math and ELA, are rated on how well their 8th graders perform on the 8th grade Science FCAT, how many students pass the state created Civics End of Course exam (EOC) and how many students pass accelerated math (like Algebra 1) EOCs or qualifying industry certifications. The number of students eligible for the “Acceleration Success” calculation in the Middle School Grade Model, is determined by the number of students in the class AND all 8th graders who scored a 3 or higher on EITHER Reading or Math in their 7th grade state assessment. To be clear, the number of students deemed eligible to take a high school level Algebra 1 course in 8th grade is NOT determined by their performance on any Algebra readiness standards but on their previous year’s FSA Math and Reading scores. The High School Grade Model includes a calculation of overall 4-year graduation rate, but otherwise is entirely determined by standardized test scores. English Language Arts scores are calculated from performance on the 9th and 10 grade FSA ELA and Math scores are determined by performance on state mandated and created EOCs. Science achievement depends on scores for the state mandated Biology 1 EOC and Social Studies achievement depends on the state mandated U.S. History EOC. In high schools, “Acceleration Success” is calculated as the percentage of graduates who, while in high school passed an AP, IB, or AICE examinations, earned a C or better in dual enrollment or earned a CAPE industry certification. In addition, high schools receive performance funding for enrolling students into these programs so there is a lot of “encouragement” to enroll students in these courses. Students, sometimes, find themselves enrolled in advanced classes they didn’t ask for and may have difficulty getting out of these classes if that is their desire. With the pressure to pass AP exams, Monroe County has paid the National Math and Science Initiative, a non-profit, almost $2 million over three years to help improve participation and passing rate on AP exams, and is now requiring AP students to attend extra Saturday sessions during the school year. What can we learn about our schools from their A-F letter grade? School grades may be a reflection of the socioeconomic status of the student body. Researchers have been able to predict school grades based on US census data alone. Chris Tienken and colleagues “predicted the percentage of students at the district and school levels who score proficient or above on their state’s mandated standardized tests, without using any school-specific information” making the need for testing obsolete! For more information, click here. More concerning, when considering a local school’s grade, is whether the school has gone through any extraordinary measures to ensure high test scores from their students. Are the students engaging in creative engaging lessons that inspire a love for learning or does the curriculum resemble test prep? Have non-tested subjects, like art, music, physical education, etc, been minimized or marginalized to preserve more time for tested subjects? Is there time in the day to read fiction or fairy tales? For the youngest students, has seat work replaced time spent in free play or exploration? For high school students, has the push towards AP classes eliminated Honors classes and/or inappropriately placed more and more students, ill prepared for the rigors of AP classes, into these classes, setting these students up for failure. Are today’s AP courses really representative of college level courses or are they little more than test preparation for the required AP exams? Parents should be asking these questions of their highly rated schools. How many hoops have been jumped through in order to earn that coveted “A” rating? What have the students missed out on while practicing “hoop jumping”? Perhaps it is not surprising that many of Florida’s voucher students leave “A” rated public schools; are they escaping from the constant test pressure? Likewise, some parents of children at schools that earn lower school grades must recognize the many positive experiences their school provides their children. Perhaps they have a wonderful chorus, an active theater group, a school garden… Maybe they focus more on the whole child and less on the test prep… Is the teaching staff loving and devoted to your children? These things are important and should be celebrated! Sadly, they are not even considered in the current school grade formula. Any straight A student can tell you their final grade did not always reflect the quality of the course. Likewise, school grades may only reflect the test scores, not the quality of the education provided. In fact, parents of children in “A” schools, or in “A” districts, should be questioning whether their school focuses too much on testing and forgets the whole child. Parents need to start recognizing Florida’s A-F School grade system for what it really is: a reflection of a test focused system that has gone too far.